Tirelessly engineered for restorative sleep. We're pioneering the future of sleep innovation. Experience a deep, relaxing rest on our smart, healing fabric and plant-based, open-cell memory foam. We've revolutionized manufacturing with the world's most eco-friendly foam creation process. Further reducing our carbon footprint, we deliver your bed using environmentally responsible packaging and direct-to-consumer shipping. Our progressive technology is redefining comfort. The smartest fabric you can sleep on. A great night's sleep can help you wake up alert, refreshed and recharged. That's why our mattresses are expertly engineered down to the last detail, including the cover. The cover is a critical part of a mattress because it's the layer closest to your body when you sleep. Our covers use Celliant®, an advanced fabric designed to help our mattresses deliver maximum performance. Our mattresses will help you sleep more and wake up less at night. Many of the body's healing and restorative processes occur while we're asleep, and are supported by circulating oxygenated blood. By using the most advanced sleep-enhancing technology, our mattresses are designed to help you get the rest you need to wake up rejuvenated and stay energized throughout the day. VPF. Creating the world’s cleanest foam with our patented process. 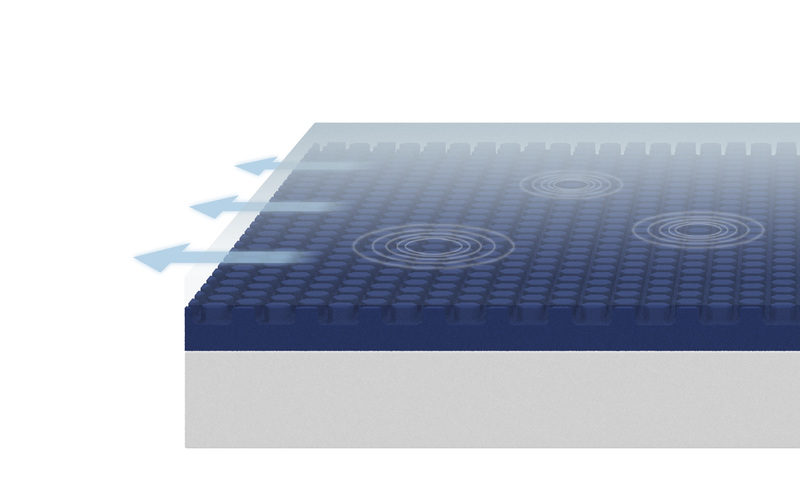 Instead of producing foam in an open environment that emits harmful contaminants into the air, we manufacture our beds using Variable Pressure Foaming (VPF), the most eco-friendly process in the world. VPF emits zero emissions into the atmosphere because of the unique closed design of the chamber. The air that leaves our VPF chamber is sent through carbon filters, which removes harmful chemicals and makes the air cleaner than when it came in. VPF is the only foam creation process that exceeds the requirements of the Clean Air Act. Our VPF process is free of harsh chemicals, creating foam with incredibly low Volatile Organic Compounds (VOCs). Because every variable is computer-controlled inside of the VPF chamber, we create foam with stronger cellular walls to enhance its durability and comfort. Any waste from this process is 100% recycled internally. The seed to your comfort. Bio-Pur™ is designed to be responsive to you and responsible for the environment. Bio-Pur™ breathes and conforms to your body. When you lie down, you'll feel Bio-Pur™ relieve your pressure points. As you sleep, the large open cell structure will better circulate air to keep your body temperature balanced from head to toe. Bio-Pur™ is crafted for your comfort. To create the most environmentally-friendly mattress, we use plant-based materials cutting out a portion of petroleum used in our foam and an exclusive Variable Pressure Foaming (VPF) manufacturing process which produces zero emissions. 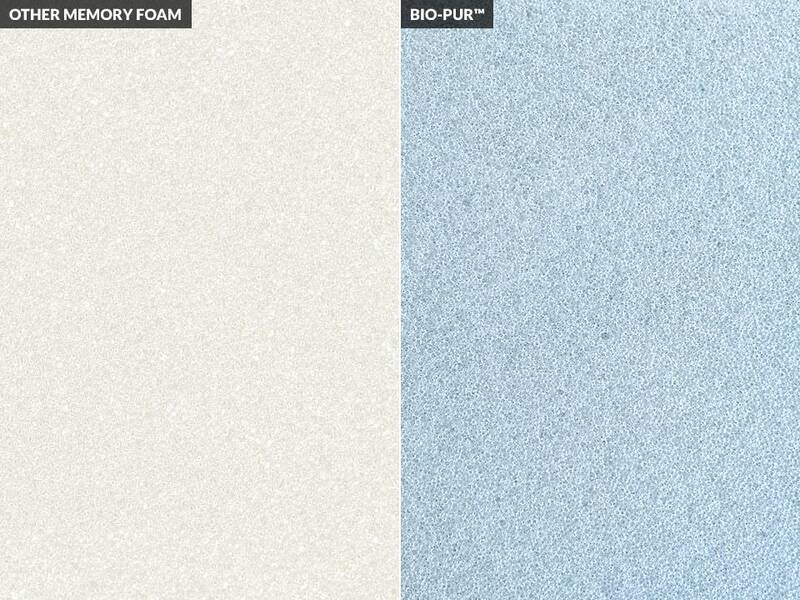 With these two advanced technologies, Bio-Pur™ makes sleeping on memory foam a guilt-free pleasure. Balancing gentle comfort with dynamic support. Amerisleep Affinity layers lie between our comfort and support layers. Affinity layers transition between these foams enhancing their softness and responsiveness. This layer combination creates a bed that's perfect for anyone that loves a softer feel. Bringing comfort to the surface. Surface Modification Technology (SMT) is an innovation in how foam reacts to your body. By modifying the bottom of our foam with specific textured channels, we provide you with smart pressure relief and improved airflow. These large channels let air circulate easily inside the mattress instead of it getting trapped. Our SMT pattern is designed to provide your body with superior pressure relief from typical pain point occurrences. The blue arrows illustrate how air flows easily through SMT channels. These channels also redistribute pressure at precise points as shown with the while circles. The core to your comfort. Bio-Core™ is the base for every Amerisleep mattress. Our Bio-Core™ supports your hips and shoulders, helping to maintain your spine's natural alignment in any position.